The household micro-grid uses this abundant element to give clients a reliable and sustainable source of power, fuel, and heat for a totally green (zero greenhouse emission) and cost effective lifestyle (self-sufficiency). 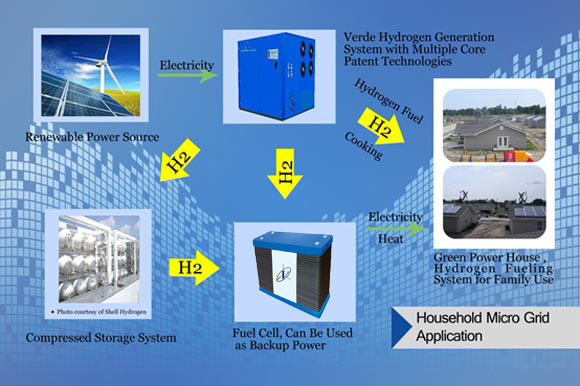 VERDE hydrogen generator, with model 1-30Nm3/h, can use the intermittent power from wind/solar to generate high purified hydrogen (>99.999%) for directly use (cooking), for power whenever is needed (through the fuel cells) and for FCVs (fuel cell vehicles). When the electricity is being over produced, hydrogen will be generated and stored in the tank for further usage. Also, the heat generated from fuel cell can be used for hot water.